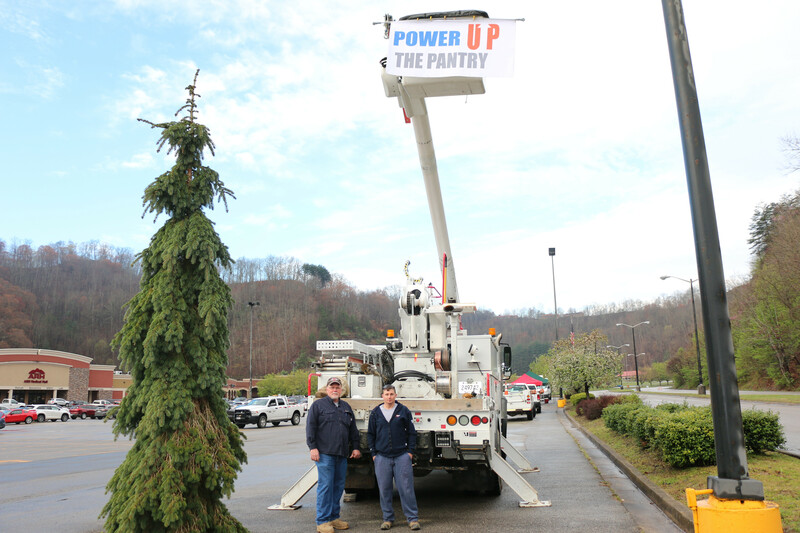 Kentucky Power employees use a bucket truck to promote Power Up the Pantry in Hazard. HAZARD, Ky. – Kentucky Power contributed $5,000, numerous volunteers and mounds of food to Power Up the Pantry, a daylong community effort to replenish depleted area food pantries. Kentucky Power organized Power Up the Pantry as part of its 100th anniversary celebration and as one of its largest 100 Acts of Appreciation planned for the year. Kentucky Power then partnered with Anthem Medicaid, Appalachian Regional Healthcare, the City of Hazard, the City of Prestonsburg, Big Sandy Community and Technical College, Hazard Community and Technical College, God’s Pantry Food Bank, New Hope Church, and WYMT. The event collected 7.5 tons of food and more than $17,000 in monetary donations, enough for about 152,000 meals. Donations made in Prestonsburg went to God’s Pantry, which operates distribution centers in Prestonsburg and London that serve food pantries in eastern Kentucky. Hazard donations went to New Hope Church Emergency Food Pantry, which also is served by God’s Pantry. The businesses joined forces on the food drive to have the largest community impact. One in six residents in Kentucky struggles with hunger and are unsure where their next meal will come from, according to God’s Pantry Executive Director Michael Halligan. Last fiscal year, God’s Pantry supplied 34.5 million pounds of food and 13.6 million pounds of fresh produce to more than 400 food pantries and meal programs in central and eastern Kentucky. The Prestonsburg warehouse serves Pike, Floyd, Johnson, Lawrence, Magoffin, Letcher and Martin counties. The warehouse stores orders until local agencies can pick them up for distribution and also has fresh produce delivered for agencies to access. God’s Pantry also operates a warehouse in London that serves Perry and other southeastern Kentucky counties. Kentucky Power, with headquarters in Ashland, provides service to about 168,000 customers in 20 eastern Kentucky counties and is an operating company in the American Electric Power system, one of the largest electric utilities in the United States.